Water damage can spread quickly, so if you do notice signs of a broken pipe in your FishHawk, FL home or business, call us right away. A broken pipe can be a costly problem to fix, so the sooner you can catch it and get a plumber out to start on the repairs, the better the outcome. There are a few signs that you can watch for, such as whistling, banging, or clanking sounds, or the sound of water bubbling or gurgling. Odors, sink holes, and wet spots can also point to a broken pipe, so watch for these telling signs. Within your home, you might notice a sudden change in water pressure, brown or murky water coming through the pipes, or no water at all when you turn on the faucet. Check for water stains around floor drains, especially if you have a basement or lower level, since this is where a water leak tends to show up first. Some of the causes of a broken pipe include freezing (although this doesn’t typically happen here in FishHawk, Florida) or tree roots growing into the pipes and causing cracks. You might also notice your water bill is much higher one month than it has been in the past, which usually means water is leaking from somewhere. Water damage can spread quickly and lead to a lot of other problems, so if you do notice signs of a broken pipe, call us at A Step Above Plumbing right away. 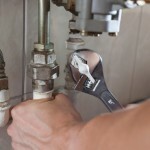 Unless you have experience with plumbing and repairs, we don’t recommend attempting to repair a pipe yourself. Some of the plumbing beneath your home carries sewage and waste water, so it can cause serious contamination if you try to replace it yourself.